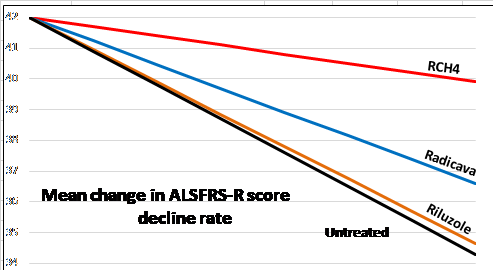 RCH4 statistically slows the decline rate by 70% when non-responders excluded from data, 63% when included. Refer to the `Direct comparison` note (paragraph two) above. Is there a specific target? No. Systemic No. Systemic Yes. (Supply of RCH4 withdrawn from some due to use of suspected counterfeit Radicava and the danger of side effects due to the counterfeits. who were using counterfeit ALS drugs). The following FDA Response to Mitsubishi Tanabe for their New Drug Application re. Edaravone may appear to confirm the above table of `Major`efficacy. However `Moderate` efficacy would appear to be a reasonable perception for genuine Edaravone. (Not counterfeit). "The data that you have submitted suggests that it would be difficult to conclude that the efficacy of Edaravone is substantially superior from that of Riluzole and we are skeptical that a more detailed comparison would be productive because of major uncertainty introduced by differences in study population and design"
Edaravone showed slower symptom progression after 6 months of treatment (refer to above chart) as measured by ALSFRS. However, due to very strict inclusion criteria (high functionality at the beginning of the study), this effect is likely to only be seen in a small subgroup of people. At 17:00 EST on Friday May 5th. 2017, the FDA in the US made a completely unexpected announcement that they had approved a new drug for ALS: `Edavarone`/ Radicava. This is excellent news, is most welcome, and is the first new drug to be officially approved for ALS since 1995. This brings a much-needed additional medication to a neurological condition for which there is a critically unmet need. Previously, there was only one drug `Riluzole` licenced worldwide, and it is now hoped that `Edavarone` will gain approved status globally before the end of 2017. It is produced by a large and respected Pharmaceutical company `Mitsubishi Tanabe` in Japan. Whereas it is most welcome that another ALS/MND drug has been approved, there are some issues to be considered, as with any new drug. There is a major issue with ALS. It is a most heterogeneous condition which varies with every patient, and indeed it may actually be different diseases presenting the same. Accordingly it is very difficult to arrive at a definite diagonosis. A definite diagnosis is usually determined when symptoms are confirmed in three areas of the body, e.g., bulbar (mouth), upper and lower limbs.